Director – Ciaran Foy, Screenplay – C. Robert Cargill & Scott Derrickson, Producers – Jason Blum, Scott Derrickson & Brian Kavanaugh-Jones, Photography – Amy Vincent, Music – tomandandy, Visual Effects – Legion Studios (Supervisor – James David Hattin) & Temprimental Films (Supervisor – Erick Geisler), Special Effects Supervisor – Bruce Strong, Makeup Effects – SOTA F/X Inc (Supervisor – Roy Knyrim), Production Design – Bill Boes. Production Company – Blumhouse/Entertainment One/IM Global/Automatik Entertainment/Tank Caterpillar. Courtney Collins has fled from her abusive husband with her two boys Dylan and Zachary and they are staying at an abandoned farmhouse. There ghost children appear to Dylan at night, forcing him to watch a series of 8mm films in the basement that depict them each perpetrating horrible deaths on their own families. Meanwhile, the former deputy who aided Ellison Oswalt is still trying to cope with what happened. He is tracing the other houses where the murders happened and burning them down to prevent this from happening again. He arrives at Courtney’s place where she initially thinks he is an investigator sent by her husband. He inspects the abandoned church on the property where the murders occurred but becomes involved in standing up to protect her as her husband sends state troopers to take the boys back. He tries to make sure they do not leave, knowing that this will target them as victims of the entity Buughul, all the while becoming involved with Courtney himself. As the ghost children pit the two boys against each other, inspiring them to kill, Courtney’s husband arrives and forces her and the boys to return with him. Sinister (2012) was a modest hit for Scott Derrickson. I had mixed feelings about it but Derrickson delivered an undeniable number of jumps and some uncanny atmosphere, even if the film felt underdeveloped in terms of explaining what was going on. Audiences clearly ranked Sinister higher than that and I even seen it referred to as a modern horror classic. Sinister 2 is a sequel. Scott Derrickson steps back to produce and write the script, while the captain’s chair is inherited by Irish director Ciaran Foy who had previously made the undeniably effective urban horror Citadel (2012). 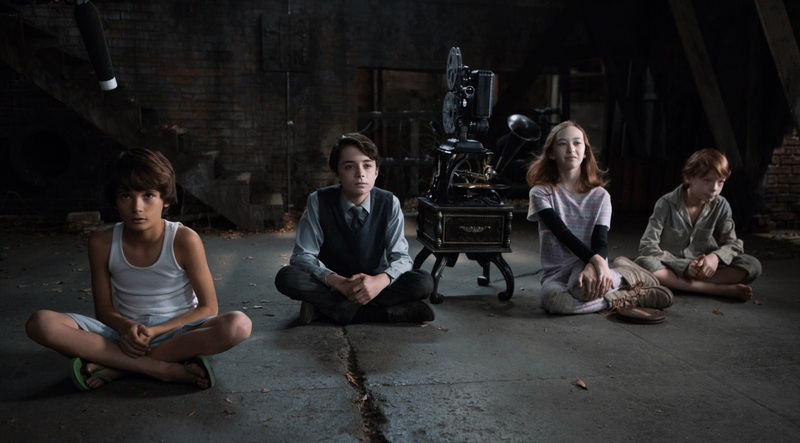 The Sinister series comes from Jason Blum’s Blumhouse production company who make a point of making their films on modest budget and in ways that allow them to spin them out as sequels – as they have successfully done with the Paranormal Activity series and other hits like Insidious (2010) and The Purge (2012), which are both now into their third entry. (See below for Blumhouse’s other films). The inevitable case comes with Sinister here. The problem for me when it comes to viewing Sinister as a franchise was that the original was such a shaky house of cards that it does not readily make for sequel material. Some films are intended for sequels or to spawn franchises; many others end up that way when their predecessor was an unexpected hit. Most of these are stuck with conceptual problems of offering up enough that is the same but not too similar that audiences will feel ripped off. Both the Saw and Insidious series and their complicated backstories are examples that did this reasonably well, as did The Omen series, which used the opportunity to follow its anti-hero’s journey from child to adult. On the other hand, many other films are left stuck with just delivering more of the same. This becomes a problem when the original gives scanty material to work with in the first place – a perfect example of this is the Final Destination series, which extended to four limited variations on the first film’s plot without ever offering any explanation of the mechanism whereby people receive premonitions of disaster and how preventing it from occurring labels them for bizarre deaths. Sinister 2 is a prime example of a weak and ill-explained original being awkwardly over-extended into more of the same. Thus we have cryptic mention of the Babylonian deity named Buughul who is no more explained here than in the first film. There are all of the same arbitrary things happening for no other reason that the scriptwriters have decided they should – children are inspired to murder their parents and film the acts, the 8mm films are left around for people to watch, more is made of the rule about people being targeted after they move from a murder site and into a new house. I scratched my head trying to make sense of it after the first film. However, seeing it all stretched out again and with equally little in the way of explanation – even though the script is written by C. Robert Cargill and Scott Derrickson who both wrote the original – the show feels like a house of cards being built in mid-air. The first film got past this by Scott Derrickson delivering some eerie and outlandish scares. Not the same can be said for Ciaran Foy’s work on the sequel. This feels about a generic and processed as horror becomes these days. There is the mild generation of scenes that might provide jumps to one or two people who have never seen many horror films before but the atmosphere is tiresomely tame for anybody else. None of the outlandish novelty deaths on the 8mm films hold anything that has the impact that the opening scene in Sinister did. Jason Blum and his Blumhouse production company have produced a number of other genre films including:- Hamlet (2000), Paranormal Activity (2007) and sequels, Insidious (2010) and sequels, Tooth Fairy (2010), The Bay (2012), The Lords of Salem (2012), The River (tv series, 2012), Dark Skies (2013), Oculus (2013), The Purge (2013) and sequels, the tv mini-series Ascension (2014), Creep (2014), Jessabelle (2014), Mercy (2014), Mockingbird (2014), Not Safe for Work (2014), Ouija (2014) and sequel, 13 Sins (2014), The Town That Dreaded Sundown (2014), Unfriended/Cybernatural (2014), Area 51 (2015), The Boy Next Door (2015), Curve (2015), The Gallows (2015), The Gift (2015), Jem and the Holograms (2015), The Lazarus Effect (2015), Martyrs (2015), Visions (2015), The Visit (2015), The Darkness (2016), Hush (2016), Incarnate (2016), The Veil (2016), Viral (2016), Amityville: The Awakening (2017), Get Out (2017), Happy Death Day (2017), The Keeping Hours (2017), Split (2017), Stephanie (2017), Bloodline (2018), Cam (2018), Delirium (2018), Halloween (2018), Seven in Heaven (2018), Truth or Dare (2018), Upgrade (2018), Ma (2019), Relive (2019) and Sweetheart (2019).